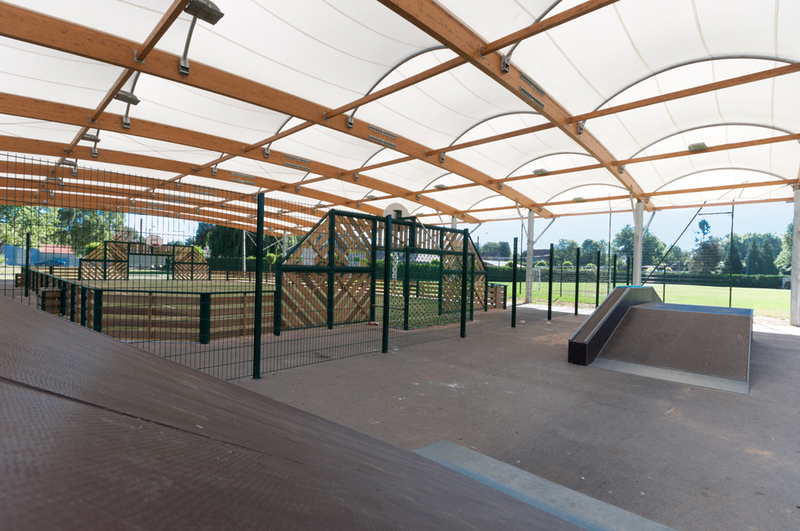 This cost effective and eco-friendly design is of particular interest to local councils and schools with limited land space, making it possible to have outdoor and indoor facilities on the same site. 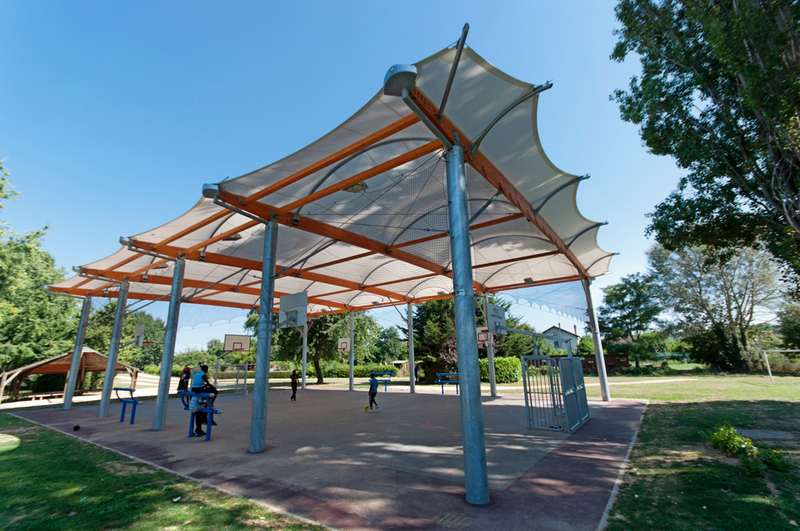 The covered playground with no walls is designed for regular, year-round use, sheltered from the weather. SMC2 has over 10 years experience in providing quality turnkey covered playground construction solutions and designs to suit your site characteristics, budget and business requirements. 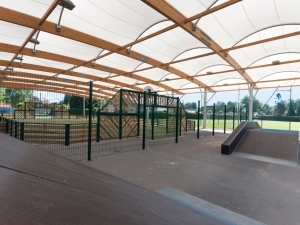 Our covered playground structures are suitable for schools, local councils, childcare centres and universities, anywhere where the addition of extra playing or sporting space is required in a short time and at reasonable cost. 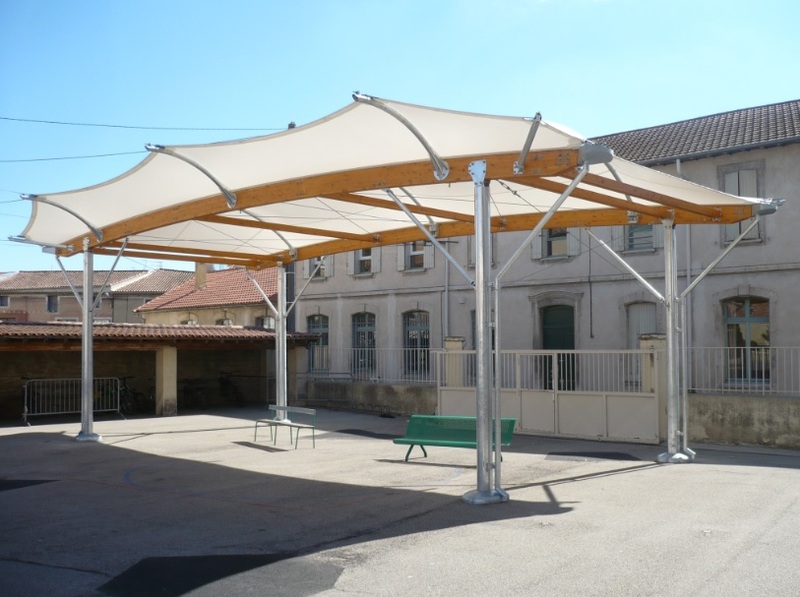 We can build these on most sites where protection from the elements, like rain and direct exposure to light, is needed. 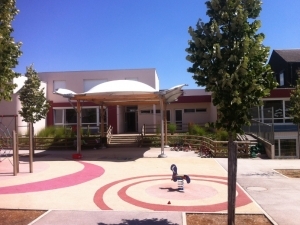 SMC2 covered playgrounds use a unique combination of building materials to give a cost-effective, functional, attractive and comfortable environment to students, staff and parents. 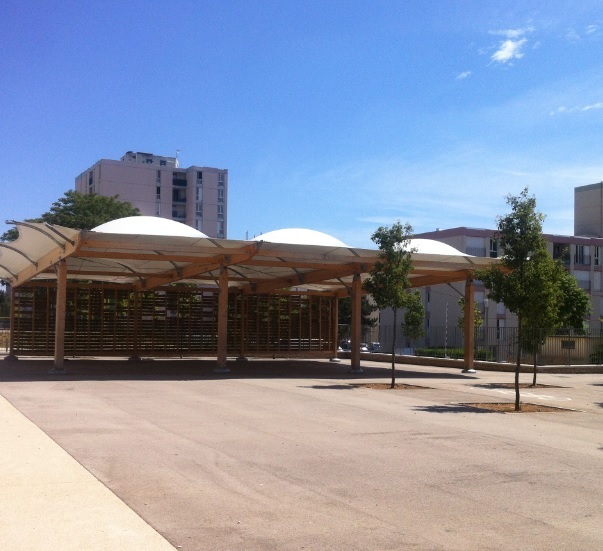 The structure framework is a combination of laminated timber and steel and have a rated design life of 30 years. The eco-friendly timber is sourced from sustainably managed forests, is fire resistant and may be used in harsh chemical environments or where there are extremes of weather. This means dimensional stability in spite of temperature variations. 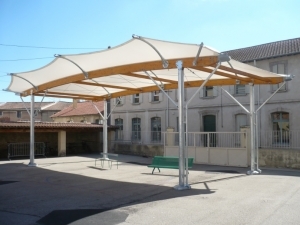 The translucent tensile fabric membrane roof diffuses the natural sunlight as well as reducing sound reverberation and echo. The saddle shaped curves in the roof increase structural stability in addition to being visually appealing. 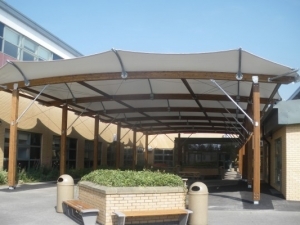 The membrane is guaranteed for 15 years and is 100% recyclable. 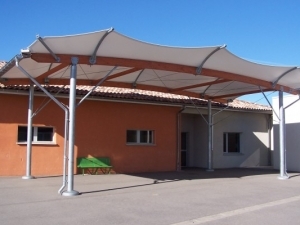 In summer the white membrane reflects excess energy from the sun and minimises thermal storage thus preventing overheating. 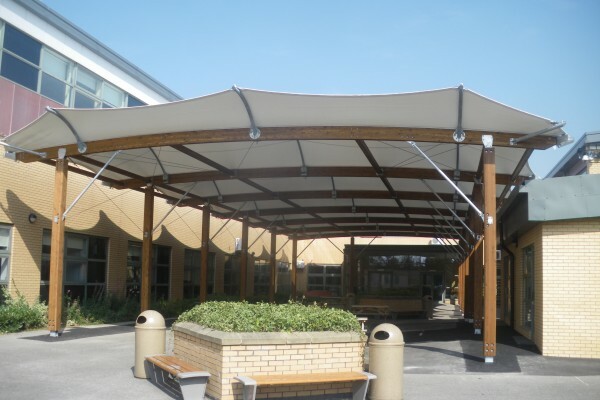 The membrane cover protects from direct UV exposure and from the rain. 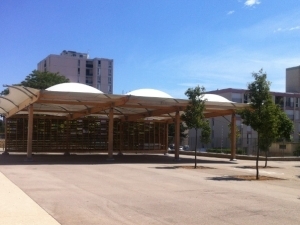 The roof is designed to manage extremes of weather including strong wind. 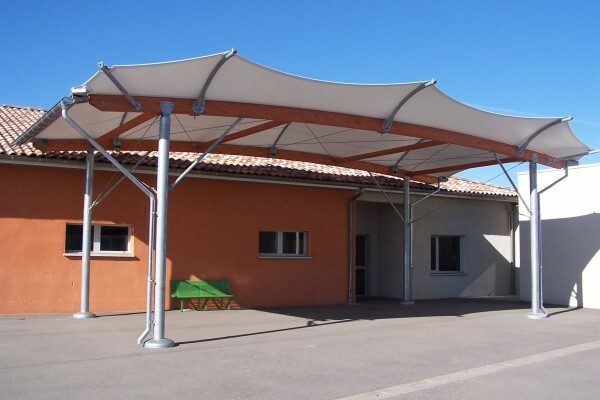 Once the manufacturing process is finished, the prefabricated construction materials are then shipped to the construction site where they are assembled by our qualified teams as it would happen with a prefab building, without any welding, drilling or painting. Our structures are typically pre-assembled on the ground then lifted to position, requiring clear access to an area slightly larger than the completed structure. The installation of our buildings are fast and they allow a better cost control and a small site clean-up. Our professional supervising teams are involved in the construction right down to the last detail. After identifying your needs and requirements, we submit a draft design presenting the dimensions and shape of the proposed structure and then proceed to the cost-estimation. Once you are satisfied with our proposal, our specialised teams supply the engineering plans to start the manufacturing of the construction materials. All the elements of our structures are custom-made in our manufacturing plants. The AS/NZS 1170.2:2011 to set out procedures for determining wind speeds and resulting wind actions to be used in the structural design. The AS/NZS 1170.0 which specifies general procedures and criteria for the structural design of a building or structure in limit states format.